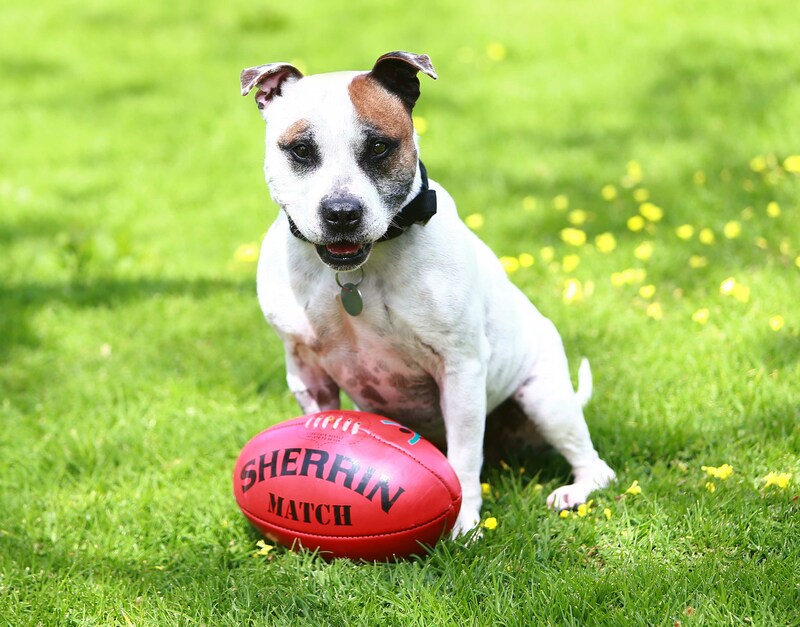 Lots of doggies were winners over the AFL Grand Final long weekend, and senior pooch Bruce was one of them. At almost eight years of age, senior pets like Bruce aren’t always the popular choice among adopters. But, when Matt visited our North Melbourne shelter and met the laid-back Staffy cross, they formed an instant mateship. 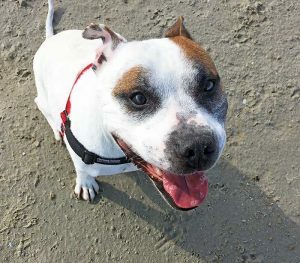 “He is a big softie, loves cuddles and belly rubs,” said Matt. When Bruce arrived at his new home, there was lots of exploring to be done. “Bruce had a treat and searched his new backyard, marking all the trees. 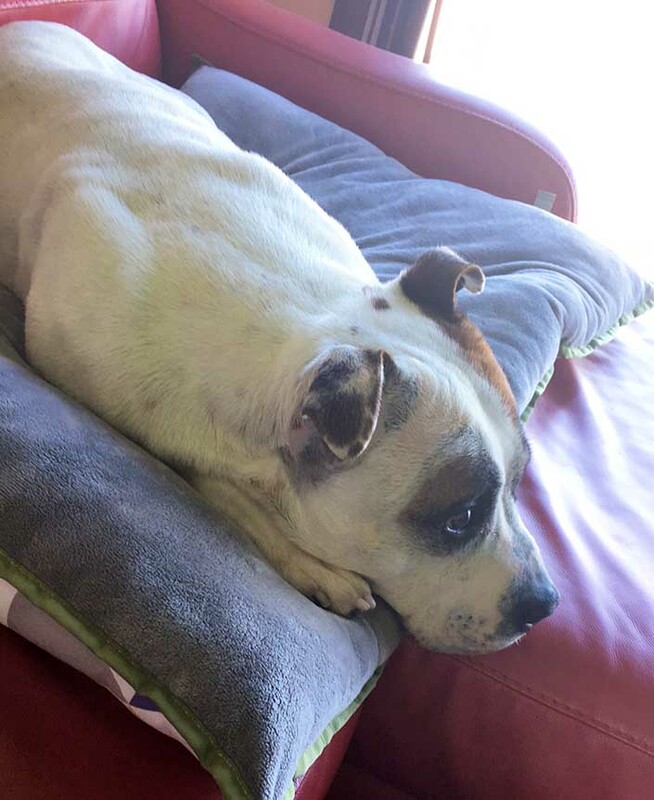 We then explored the house, showing Bruce that he is welcome on the couch,” said Matt. Lucky Bruce lives right near a dog park and beach, where he has already made lots of new friends. “From upstairs, Bruce can see and hear the dogs at the park across the road, so I took him across for a walk. He met the neighbours’ dog and a lot of others. I have found he loves tennis balls. He can catch and he brings them back to be thrown again and again. He’s a fan of the water also,” said Matt. In between his bursts of energy, Bruce equally enjoys some downtime with his nearest and dearest. “He’s asleep now, snoring away. He’s a bit of a bed hog, or maybe he’s just a snug puppy wanting continual cuddles,” said Matt. Bruce is the third dog adopted into Matt’s family. The other two, Jessie and Buddy, live the country life by the river with Matt’s parents. “I do thank The Lost Dogs’ Home and all staff and volunteers for all the amazing things you do re-homing pets to forever homes,” said Matt. With their gentle demeanour and endless devotion, senior pets like Bruce have years of experience at being a family companion. They waste no time settling into their new home. So, adopt a Golden Oldie today!